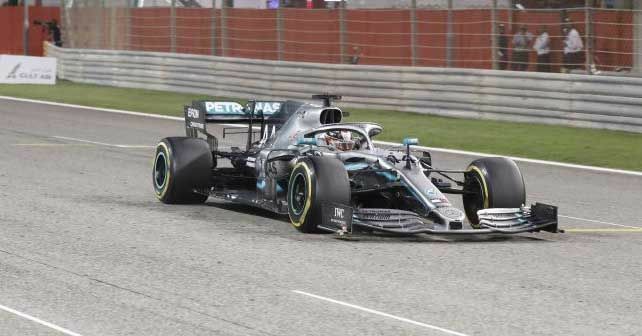 Mercedes's Lewis Hamilton wins Bahrain Grand Prix as Charles Leclerc's Ferrari loses the lead. Valtteri Bottas takes second spot to make it another 1-2 finish for the Silver Arrows. Lewis Hamilton was gifted a race win in Bahrain, as Ferrari’s Charles Leclerc suffered an unfortunate technical issue in the closing stages while he was leading the race. Leclerc’s misfortune also allowed Mercedes’s Valtteri Bottas to take the second spot, making it another 1-2 finish for the Silver Arrows after the opening round in Australia. Leclerc limped to a third-place finish to claim his first Formula 1 podium. After performing dismally in Australia, Ferrari came to Bahrain with a stronger package, as both of their drivers managed to lock the front-row in the qualifying. However, it was the newcomer Leclerc who beat his teammate and four-time world champion Sebastian Vettel to claim his maiden pole position. The Mercedes duo of Hamilton and Bottas qualified in third and fourth, respectively. As the lights went out, Leclerc got off to a slow start, allowing Vettel to take the lead in the opening lap. In fact, even last race’s winner Bottas, too, passed him – as well as his teammate Hamilton – to take the second spot in lap 1. However, within a lap, Leclerc found his mojo back and overtook Bottas. Leclerc’s move on Bottas pushed him a little wide, meaning Hamilton also passed him in the process. Post this, both the Mercedes drivers got in a bit of a fight with each other, while Leclerc upped the pace and caught up to his teammate. In lap 6, Leclerc was right behind Vettel, and after a bit of resistance, Vettel had to let his faster teammate through. Leclerc ran a flawless race from then on and was in total control at the front. Behind him, though, his teammate came under pressure from Hamilton. Both drivers fought tooth-and-nail for the second spot – it was an intense but clean racing between the two. However, a momentarily lapse by Vettel sent his Ferrari to a 180-degree spin. Vettel suffered a puncture in the left rear as a result, which also resulted in a damaged front wing. This forced Vettel to pit, he lost a good chunk of time and came out behind Bottas and Red Bull’s Max Verstappen in fifth. With 10 laps to go, though, disaster struck Leclerc, as he suddenly struggled for pace and reported an engine issue. Within a few seconds, Leclerc was losing around 4 seconds/lap to Hamilton and was now a sitting duck. Hamilton caught and passed Leclerc in the next two laps without any effort. Leclerc was so slow that even Bottas, who was over 20 seconds behind, was able to pass him with 4 laps to go. Leclerc's maiden podium finish also came under threat from Verstappen, but the sudden retirement of Renault cars of Nico Hulkenberg and Daniel Ricciardo on the trackside, thankfully, prevented that from happening as the race came to a close under safety car period. Verstappen had to settle for fourth, while Vettel took the fifth spot.